You came highly recommended and I can see why! You took the guess work out of the process and answered all of our questions. Thank you for helping us get our project from the planning phase to the building phase. We are thrilled with our plans and the service and we definately got more for our money than with any other company we spoke to. Thanks again for all of your help. It's been a breath of fresh air. We've been really impressed with absolutely everything you've done for us and are really happy with the work and detail you've put into the drawings for us. It's well and truly exceeded what we expected you to do for us by a long way. Selfbuildplans have been very professional and easy to work with. We would recommend them to anyone who desires a well thought through plan that is incredibly detailed. Even across the country, these true professionals see that their clients are serviced in an extremely timely fashion and make themselves available for any questions that one may have. We could not be more pleased! - Tim and Debbie C.
Just wanted to let you know that I am thrilled by your latest plans. The screened porches, large bedrooms, single eating areas, spacious rooms.... and no wasted spaces... all add up to the perfect home. I have looked for years for homes with these attributes, and your recent designs really have them all. Thanks for designing my dream home. Just wanted you to know that this plan, is so cool! It addresses all of a family's needs, today. Love the His/Hers closets, the angles, the bonus room and open floor plan! If we were ever to build again, this would be it! Kudos to you! 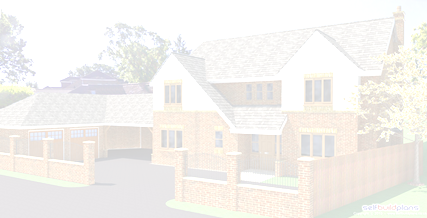 To compliment your chosen housetype we also offer a complete planning package from just £650. Site plan at 1:500 including site specifics of new boundary walls, interface dimensions, access details etc. Design & access statement of approx. 20 pages including previous planning history, full area photo’s, LA policies etc. The above is the minimum information required for any residential planning application and there maybe additional information required, of which we will advise. Please do not think that this must not be a professional service as we have over 25 years of producing residential schemes and house designs and guarantee you will not be disappointed with our service. Please contact us to discuss your ideas, proposals or specific requirements for a free no obligation quote. Copyright © 2014 www.Selfbuildplans.co.uk. Suppliers of House Plans for the UK market.